John Hammond’s epic vision of a dinosaur theme park has been a reality for 10 years now. But with visitor admissions down and interest dwindling, the owners decide to cross-breed a new species which doesn’t end well for anyone visiting Jurassic World. 22 years after Stephen Spielberg redefined the summer blockbuster, we are now invited to enter Jurassic World. The set-up for this is fantastic and having a fully functional theme park populated with people gives the film a fresh dynamic that we haven’t seen before. The film starts off brilliantly with a coherent, logical set-up of where we find the Jurassic brand in the modern world. The inner workings of a theme park and their struggles to stay relevant for an ever-demanding audience are laid down well. It strikes a perfect balance and legitimises the central plot of genetic engineering to create a new, cross-breed species that will once again become the main attraction. The characters themselves are all great but their use and characterisation raises some questions. The script is very clunky which means Bryce Dallas Howard and Guardians of the Galaxy favourite Chris Pratt have a lot of work to do to keep things ticking over. Their dynamic is good but their character’s history together is not used well at all. Bryce Dallas Howard and her steely-bob haircut deliver the best performance in the movie whilst the cool-factor of seeing Pratt wrangle dinosaurs is enough to keep you suitably invested. 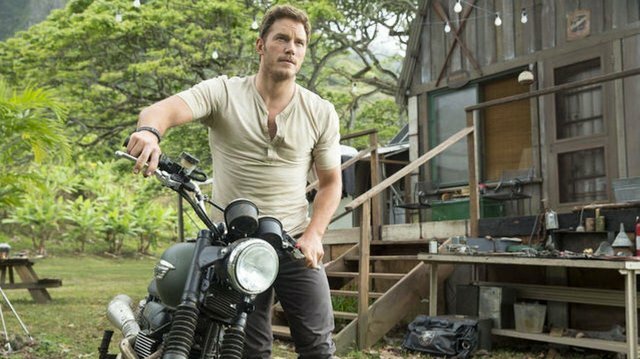 If early reports are to be believed, Pratt could also be cast as the new Indiana Jones very soon so you could look at this thrill-ride as his audition tape. He does well with an underwritten role. It’s a shame that the two leads weren’t afforded a script that plays to their obvious strengths more. The supporting cast are all solid too, but again, characterisation and script-shortcomings don’t utilise them as effectively as they should. Irrfan Khan and Vincent D’Onofrio are magnetic but not nearly onscreen enough. Ty Simpkins continues to impress and a promising career looks to be blossoming for the young actor. Judy Greer and Andy Buckley are relegated to the sidelines with a needless ‘strained-family’ storyline. As a result, Nick Robinson is unfairly given the task of providing some kind of forced angst that just doesn’t work. We are meant to believe he’s a mean-spirited older brother but he clearly isn’t, he’s just a normal teenager. Again, Robinson is not to blame here, it’s the script. Thankfully Jake Johnson is on-hand to steal his scenes and provide some great comic relief. Script woes aside, Jurassic World certainly delivers for spectacle and the main action at the end of the film is sensational. This is where the movie really succeeds by giving you plenty of wow moments and jaw-dropping effects. The new dinosaur creation, Indominus Rex, is a fantastic beast as is the giant Mosasaurus that lives in the water (the one that devours the shark in the trailer). The Indominus Rex introduction is particularly well done, with a dinosaur that’s angry, hungry and very clever looking to break out of its forced enclosure. Velociraptors make a welcome return and there are plenty of other familiar dino-faces who show up in pivotal cameos too. Jurassic World is a very entertaining blockbuster with a high action and adventure quota. It’s not scary enough though and if you re-watch the first movie, you’ll see how they got the balance just right with unsettling scenes that really drove home the severity of the situation. But then, Jurassic World was never going to be as good as the original. What it does do is provide the most logical and natural sequel to the original movie. The characterisation leaves a slightly bitter taste but the spectacle more than saves this. Jurassic World is set to become one of the years most enjoyable movie experiences despite its niggling shortcomings.